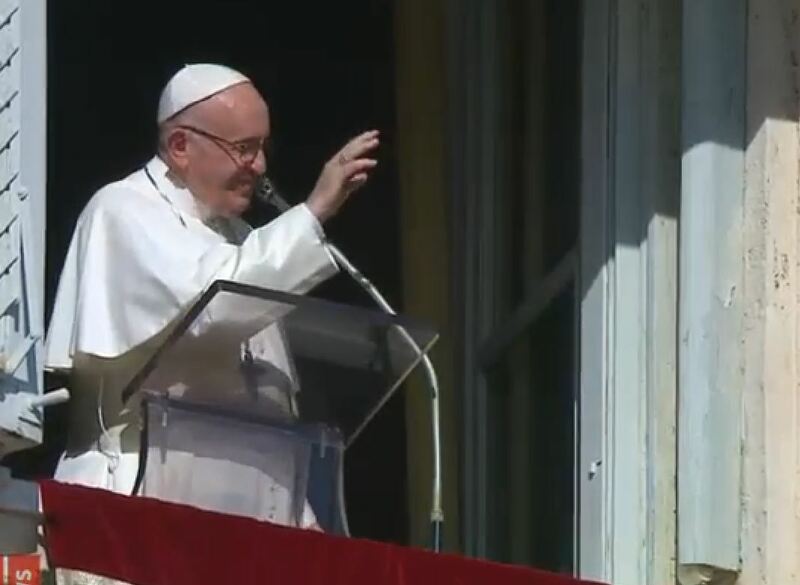 Here is a ZENIT translation of the address Pope Francis gave November 18, 2018, before and after praying the midday Angelus with those gathered in St. Peter’s Square. In the passage of this Sunday’s Gospel (Cf. Mark 13:24-32), the Lord wishes to instruct His disciples on future events. It’s not, in the first place, an address on the end of the world; rather, it’s an invitation to live the present well, and to be vigilant and always ready for when we are called to give an account of our life. Jesus says: “In those days, after that tribulation, the sun will be darkened, and the moon will not give its light, and the stars will be falling from Heaven” (vv. 24-25). These words make us think of the first page of the Book of Genesis — the account of the creation: the sun, the moon, the stars, which at the beginning of time shine in their order and bring light, sign of life, are described here in their decay, while they plummet down into the darkness and chaos, sign of the end. Instead, the light that will shine on that last day will be unique and new: it will be that of the Lord Jesus who will come in glory with all the Saints. In that encounter we will finally see His Face in the full light of the Trinity; a Face radiant with love, before which every human being will also appear in total truth. The history of humanity, as the personal history of each one of us, can’t be understood as a simple succession of words and events that have no meaning. Nor can it be interpreted in the light of a fatalistic vision, as if everything was already pre-established according to a destiny, which removes every space of freedom, impeding the fulfillment of choices, which are the fruit of a true decision. Rather, in today’s Gospel Jesus says that the history of peoples and that of the individual have an end and a goal to reach: the definitive encounter with the Lord. We don’t know the time or the way in which it will happen; the Lord confirmed: “no one knows, not even the Angels in Heaven nor the Son” (v. 32); everything is guarded in the secret of the mystery of the Father. However, we know a fundamental principle which we must address: “Heaven and earth will pass away — says Jesus –, but my words will not pass away” (v. 31). This is the true crucial point. On that day, each one of us will have to understand if the Word of the Son of God has illumined our personal existence, or if we have turned our back on it, preferring to trust in our own words. It will be more than ever the moment in which we abandon ourselves definitively to the Father’s love and trust in His mercy. No one can flee from this moment, not one of us! The craftiness, which we often put on our behavior to credit the image we want to give, will no longer be useful; in the same way, the power of money and of the economic means, with which we pretend with presumption to buy everything and everyone, will no longer be able to be used. We will have nothing other with us than what we have done in this life, believing in His Word: the all and the nothing we lived or neglected to fulfill. We will bring with us only what we have given. Let us invoke the intercession of the Virgin Mary, so that the verification of our provisional stay on earth and our limitation will not make us collapse in anguish, but call us to responsibility towards ourselves, towards our neighbor and towards the whole world. On the occasion of today’s World Day of the Poor, I celebrated a Mass this morning in St. Peter’s Basilica in the presence of the poor, accompanied by Associations and parish groups. In a while, I’ll take part in a lunch in Paul VI Hall with many indigent people. Similar initiatives of prayer and sharing are being organized in the dioceses of the world, to express the closeness of the Christian community to all those living in conditions of poverty. This Day, which involves increasingly more parishes, Associations, and Ecclesial Movements, is intended to be a sign of hope and a stimulus to become instruments of mercy in the social fabric. With sorrow, I learned the news of the slaughter carried out two days ago in a camp of displaced people in the Central African Republic, in which two priests were also killed. To this people, so dear to me, where I opened the first Holy Door of the Year of Mercy, I express all my closeness and love. We pray for the dead and wounded and for an end to all violence in that beloved country, which is in such need of peace. Let us pray together to Our Lady . . . [Hail Mary]. A special prayer goes to all those affected by the fires that are scourging California, and now also the victims of the cold on the East coast of the United States. May the Lord receive the deceased in His peace, console the families and support all those involved in the rescue. And now I greet you, families, parishes, Associations and individual faithful, who are from Italy and from many parts of the world. In particular, I greet the pilgrims of Union City and Brooklyn, those of Puerto Rico with the Bishop of Ponce, and the group of priests of Campanha (Brazil) with their Bishop, as well as the accompaniers to the Marian Shrines in the world, the Italian Confederation of Former Students of Catholic Schools, the faithful of Crotone and the choir of Roncegno Terme. I wish you all a happy Sunday. And, please, don’t forget to pray for me.